In Cameron’s (Chloë Grace Moretz) first therapy session at gay conversion camp, she’s presented with an image of an iceberg by Dr. Lydia Marsh (JenniferEhle) and her brother, Reverend Rick (John Gallagher Jr.) The sketch shows people in a boat sailing towards a frozen colossus. Rick implores her to see the totality of the dilemma. The biggest mass of an iceberg lies beneath the sea. The culmination of who we are, or how we came to be, is much more a tale of what’s underneath the surface than what’s visibly seen. 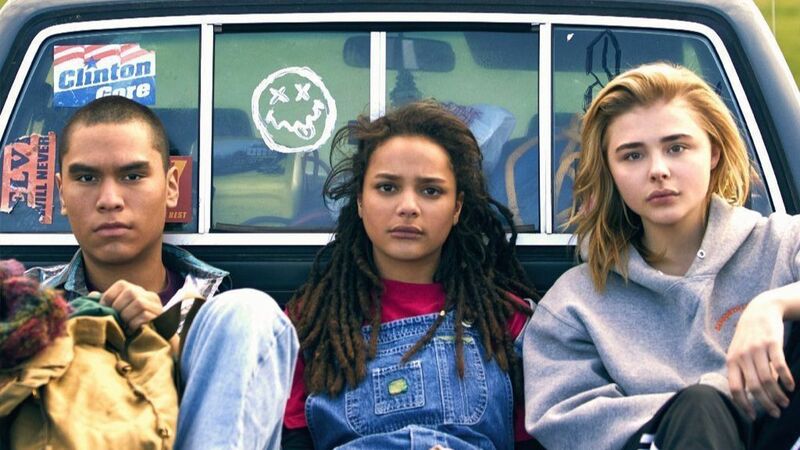 The film, The Miseducation of Cameron Post, beautifully portrays each character’s struggle to reject, process, or embrace what they’ve relegated to their inner abyss. The film takes place in the early 1990’s in Montana. The emotional and mental climate of the region and era was overwhelmingly shaped religion and community. The teens and their narrative primary focus of the feature. Lydia and Rick are a few, in a handful of adults shown throughout the film. It’s really the adolescents, tethered to each other through trauma and desperation, that shape the movie. At one point Cameron’s character bemoans, “I’m tired of being disgusted with myself all the time.” It’s this element of shame, societal rejection, and otherness that’s jabbed into the kids every day. The emotional manipulation by the adults is pervasive. Dr. Marsh reframes jolting stories of cannibalism or lifestyle choices to harness the teens. Reverand Rick is seen as a shining pillar of a successful convert. Viewers will easily spot specks of Rick’s inner conflict and clinically how their treatment is abusive, but for these disregarded youths, they believe Lydia and Rick are leading them to a path free from inner disdain. It’s this notion that binds many of them to the place and each other. Rarely do the teens ever speak of leaving. Many of them believe there’s something broken within them that needs to be fixed. As the treatment continues, several of the campers buy into the ideals of the camp while others, like Cameron’s friends, Jane (Sasha Lane) and Adam (Forrest Goodluck) do not. The intensity of the therapy increases and the weight of familial and societal rejection becomes too heavy for one camper in particular. After a violent, horrifying, and truly heartbreaking breakdown by one of them, it becomes apparent to Cameron and her friends that the only thing being taught at the camp is toxicity. The film truly highlights that burgeoning moment when you grow up and realize that adults don’t have all the answers. The time in your life where you didn’t know enough, to truly know, who knew nothing at all. Carried by a stellar cast and great direction, The Miseducation of Cameron Post really does a powerful job of illustrating the jagged and difficult journey of self-acceptance for all the characters. It’s a production that doesn’t hold back and confronts the dangers of intolerance. The film implores that whether you’re submerging elements of yourself in your personal sea, or just beginning to claim your truths, you are not a disaster. The Miseducation of Cameron Post opens this Friday, August 17th at the Landmark Ritz 5. Watch the trailer here and don’t miss it. For a complete list of cities and theaters, click here. 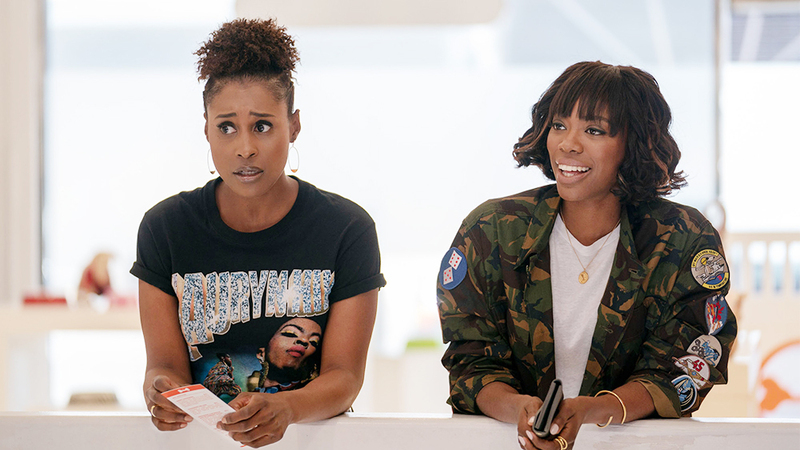 Insecure on HBO returned to our screens last night. The hit network comedy was the most talked about and buzzworthy production that returned this Summer. Sustained by its uncanny ability to paint the full spectrum of what it means to be black, navigating professional hurdles, and being adrift in the wilderness of a “you up” dating metropolis, the premiere did not disappoint. Whether you’re constantly suppressing the urge to snap at work, leaving things unsaid in your relationships, or been a passenger in a Lyft ride from hell, the show’s welcome back had something for you. The show picked off right where we left off. Issa’s life is still in shambles, Molly’s life is still in shambles but less visibly, and Daniel still works out. In one scene of the stellar episode, Issa and Molly pick up a duo of young women for their night out. As the girls begin to outline their night, Issa and Molly can’t help but link eyes and quietly exclaim “that was you” to each other. There’s true nostalgia at this moment, referencing a reckless and younger version of themselves. Any fan of the series sees this frame as a microcosm of the show. The two leads, exalting in how far they’ve come from those wild nights while disregarding the idea that they are still those individuals. Issa is sleeping on her ex’s couch and stumbling in her work life. Molly is still sleeping with a married man who can never love her completely. As a viewer, it will be fun to see is this bestie pair can ever get out the backseat of their own lives. Until then, millions of fans will tune in, laugh, and enjoy the ride. 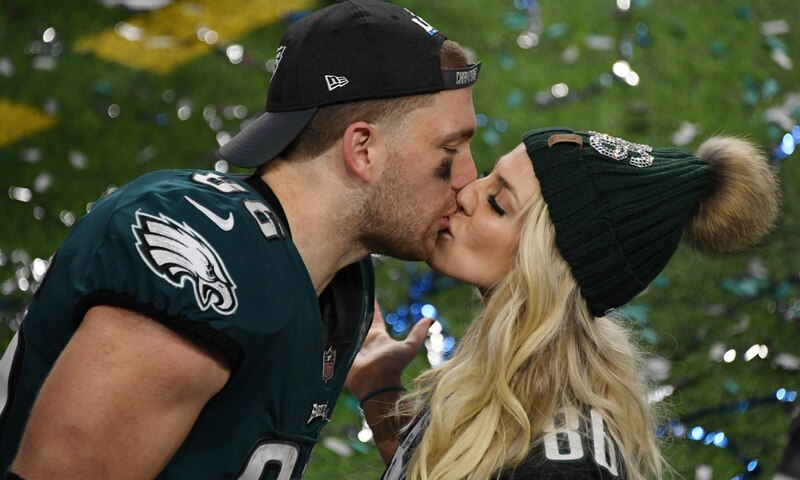 Julie: We initially met at a baseball game at Stanford. We had mutual friends. After I won the U20 Women’s World Cup [in 2012], he sent a congrats [text] on our win. Then I watched a football game that he was in, and he scored this huge touchdown. I texted him, “Congratulations, so cool to see you doing well.” I guess a little bit of succeeding kindled our relationship. Zach: We have a book that keeps a tally of wins. There are two sides of the book; one’s labeled “Z” and one’s “J,” and it’s just a running tally of victories, because Julie is a known cheater. [laughs] She exaggerates how many victories she has. So we had to create this book in order to hold each other accountable. Read the full interview here. Also, check your local listings for the re-air of the amazing feature. -The Teen Choice Awards drew its smallest viewership in history last night. The fact that I discovered that the show even aired via this fact, tells you everything you need to know. Whether it’s the new Oscar categories, it’s pretty apparent that previous popular award shows are being relegated to the land of the forgotten. -Last week several of the top shows released their fall premiere date. The rundown included the Kevin Spacey-less return of the Netflix series House of Cards, which returns on Friday, November 2nd. For a full list of every 2018 premiere date, click here. –The Meg and BlacKkKlansman had big weekends at the box office. The Jason Statham and Ruby Rose led shark production defied projection and totaled 98.6 million internationally. The Spike Lee film BlacKKKlansman brought in 183 million. It’s Lee’s best opening in over a decade. – One last proclamation: Outside of the comic book sphere, I’m looking at you Thanos and T’Challa, Mission: Impossible – Fallout gave us the best domestic action film of the year!